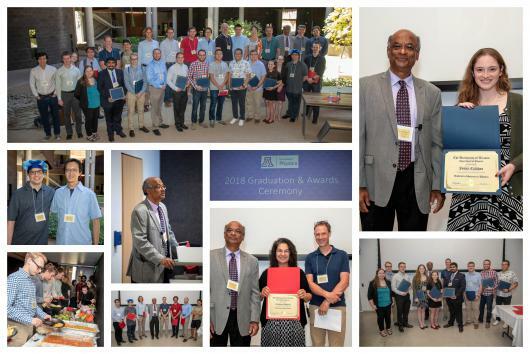 The Physics Department Spring 2018 Graduation was celebrated with a ceremony and lunch on Thursday, May 10, 2018. The ceremony, held in the Agnese Nelms Haury Lecture Hall of the ENR2 building on the UA campus, began with a welcome speech by Dr. Sumit Mazumdar, Physics Department Chair. Undergraduate degrees were awarded next, followed by the Masters of Science, Professional Science Masters in Medical Physics, and Doctor of Philosophy in Physics. The Physics Department also announced their scholarship and departmental awards. The ceremony finished with remarks by Associate Dean of the College of Science, Dr. Elliot Cheu, and comments from graduating students. Guests enjoyed a buffet from acclaimed El Charro Restaurant. We would like to thank all of our generous donors and alumni for your support and assistance, and we wish all our graduates great success in their future endeavors! Stefan Evans - Masters in Physics and continuing to complete his Ph.D.
Martin Formanek - Masters in Physics and continuing to complete his Ph.D.
Ming Ho (Samuel) Luk - Ph.D. in Physics. Thomas McClintock - Ph.D. in Physics. Ty Newhouse-Illige - Ph.D. in Physics. Jorge Palos-Chavez - Masters in Physics and continuing to complete his Ph.D.
Abhay Shastry - Ph.D. in Physics. Scott Sawyer - Masters in Physics and continuing to complete his Ph.D. The Gregson Scholarship in Physics is awarded to junior or senior students enrolled in the department and selected on the basis of scholarship, character, and engineering promise. This scholarship was established by an endowment by George Gregson of Beverly Hills, California. Our Gregson Scholarship recipients are Adam Bauer and Gutav Kehris. The Kenneth S. Krane Endowment for Undergraduate Education was established by former UA Physics undergraduate student, Kenneth S. Krane of Corvallis, Oregon. The recipients are full-time undergraduates majoring in physics with preference given to juniors and seniors with a 3.5 GPA or higher. Our Krane Scholarship recipient is Collin Lewin. The Glenn C. Purviance Scholarship in Physics is made possible by a bequest from the estate of the late Glenn C. Purviance of Tucson, Arizona. This scholarship is for upcoming freshmen or continuing students majoring in Physics or Engineering Physics at the UA. Our Purviance Scholarship recipients this year are Massimo Pascale and Casey Frantz. The Vesto M. Slipher Scholarship is funded through an endowment from Mr. Slipher and is awarded "to worthy students who are pursuing studies in science," most often awarded to an undergraduate. Our Slipher scholarship recipient is Matthew Mitchell. The Weaver Award for Undergraduate Research in Physics is made possible through a gift from retired professor of physics, Albert Weaver. Award preference is for juniors and seniors studying physics with an outstanding record in their major courses and have demonstrated promise as a research scholar. Our Weaver recipients are Alex Stoken, Catherine Weibel, Max McKie, and Scott McKinley. The Cubic Corporation Scholarship is awarded to undergraduate students majoring in physics nominated by the Physics Department Committee. Our Cubic Awardees this year are Emily Walla and Madison Walder. The Leavitt Prize is funded by an endowment established as a memorial to the late John A. Leavitt, Professor of Physics, 1960-1995. This award is for undergraduate students who complete four experiments in the physics Advanced Lab with the highest cumulative average score. Our John A. Leavitt Experimental Physics Prize is awarded to Matthew Mitchell. The FanFare Travel Award was established in memory of Physics Professor Emeritus Chang-Yun "Charlie" Fan who began mentoring and teaching at the University of Arizona in 1967. The annual award supports travel for outstanding UA Physics students selected to present original research at national or intentional conferences. Our Fanfare Travel Awards this year went to Souratosh Khan, Jeff Kost, and Anirban Kundu. Every year, the Department of Physics select students, staff and faculty who have been nominated for their outstanding service and scholarship in the department. Our Outstanding Physics Department Senior is Aidan Gibbs . Our Outstanding College Science Senior is Jenny Calahan. Our Outstanding Staff Award goes to Carmen Montijo. Undergraduate Teaching (Faculty) goes to Weigang Wang. Graduate Teaching (Faculty) goes to Erich Varnes. The department of Physics and the College of Science offer awards and scholarships every year to our most outstanding students, faculty, and staff. These awards are made possible through the generous support of our donors and alumni.